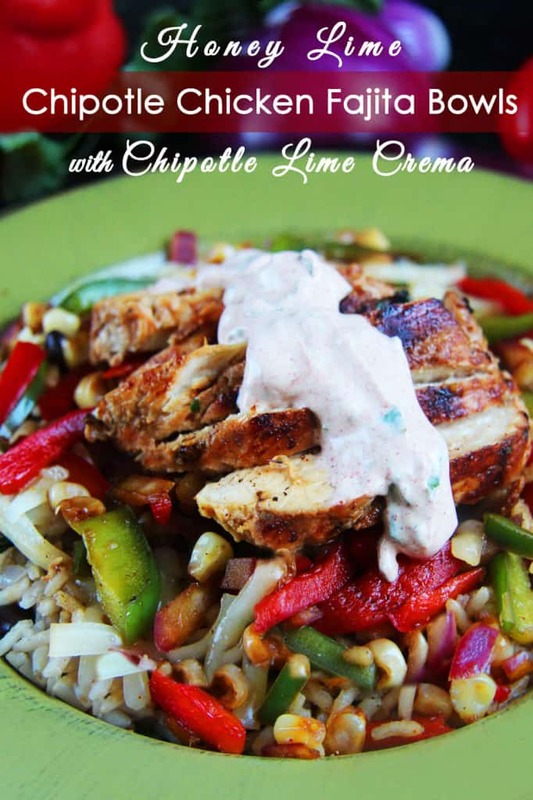 Chili Lime Chicken is wonderfully moist, tender and exploding with flavor from an EASY rub – perfect for salad, burritos, pasta, tacos etc. You will love having this on hand! 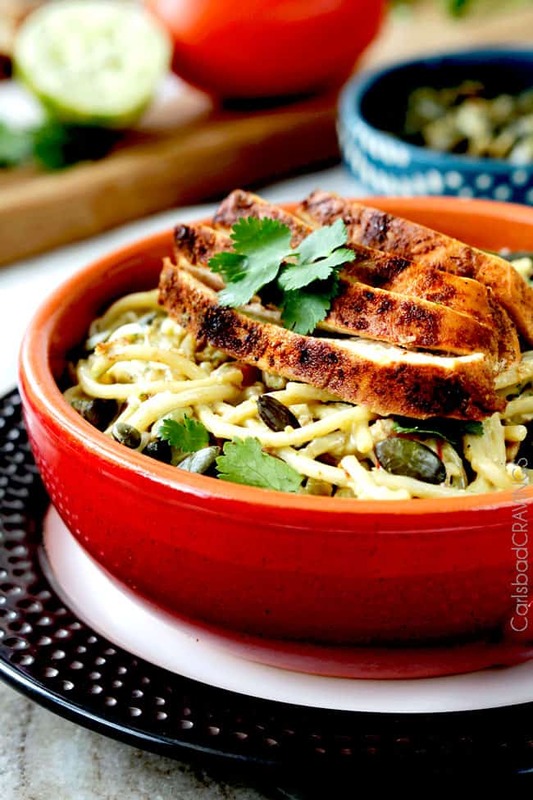 Chili Lime Chicken brings the flavor party to everything! 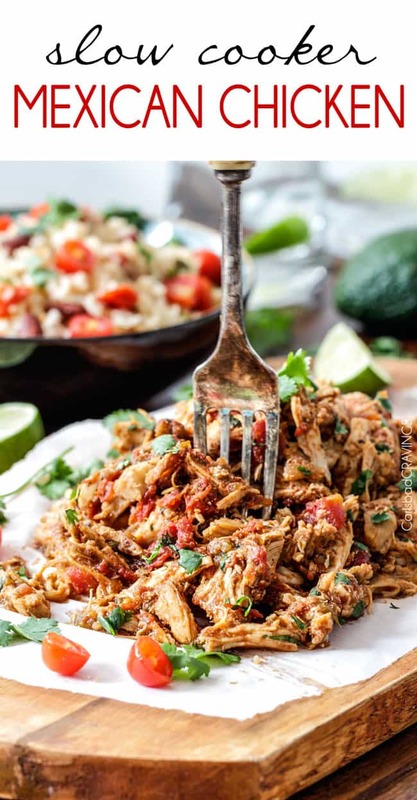 Serve this juicy, marinated, fiestalicious Chili Lime Chicken with your favorite Mexican Rice, pile it on your favorite Mexican Salad (like my Southwest Pepper Jack Salad – yes please! ), as filling overflowing tacos, burritos, wraps fajitas, etc. 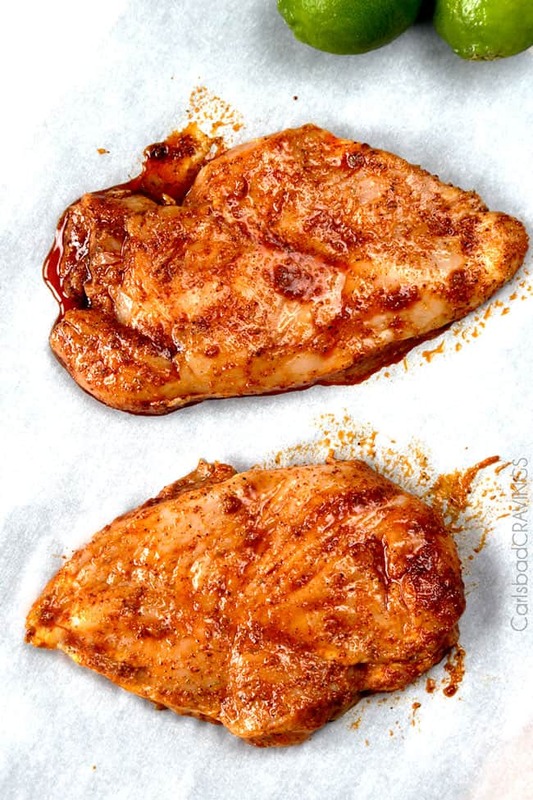 The possibilities are endless for this chicken and so is the flavor AND its as easy as rub, cook, eat! Then slather your pounded and tenderized thin chicken with the rub to drink up the rainbow of chili lime spices. 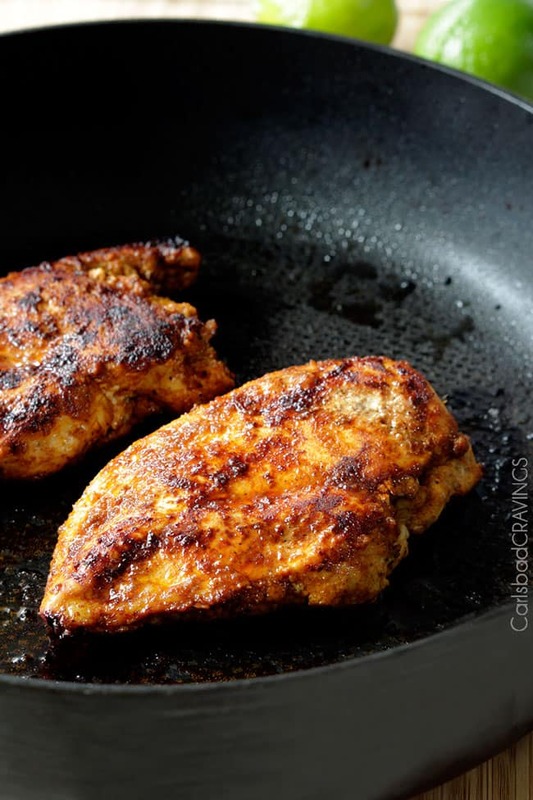 At this point, if you are pressed for time, you can cook your chicken right away, or if you have 30 minutes, let your chicken rest while you prepare the rest of your meal to further tenderize the chicken and allow the flavors to develop OR for an even greater explosion of flavor, marinate the chicken with the rub for up to 8 hours. A-M-A-Z-I-N-G! 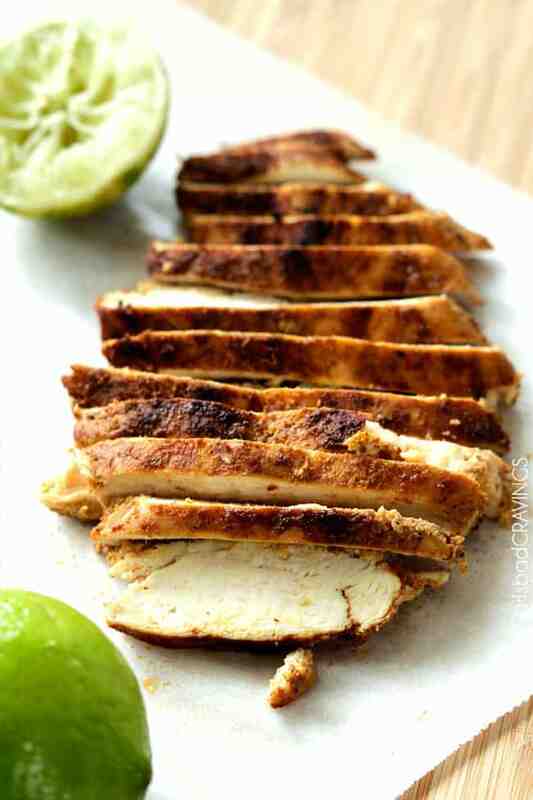 Finally, let your Chili Lime Chicken rest for 5 minutes to reabsorb all of its juices…if you have the will power. And continue to consume plain, or add Chili Lime Chicken to virtually anything to transform it into a meal almost instantly from my Mexican Rice or Cilantro Lime Rice, Southwest Salad, Avocado Pasta, etc. 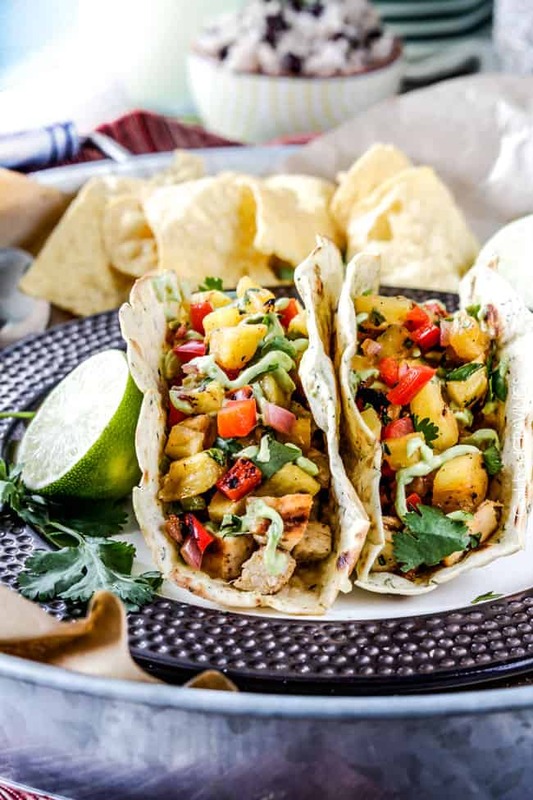 This Top 5 Carlsbad Cravings Recipe (a must try) Chili Lime Chicken Tacos with Grilled Pineapple Salsa. Juicy fiestalicious Chili Lime Chicken. An effortless party of flavors awaits! Chili Lime Chicken is wonderfully moist, tender and exploding with flavor from an EASY rub - perfect for salad, burritos, pasta, tacos etc. You will love having this on hand! Garnish with extra fresh lime juice if desired. Congratulations on your 1 year anniversary! I’m loving all the different spices used, this sounds like delicious chicken. Thank you so much Janette! And thank you for answering all my questions in the beginning and all your constant support! I am so grateful for your blogging friendship :)! 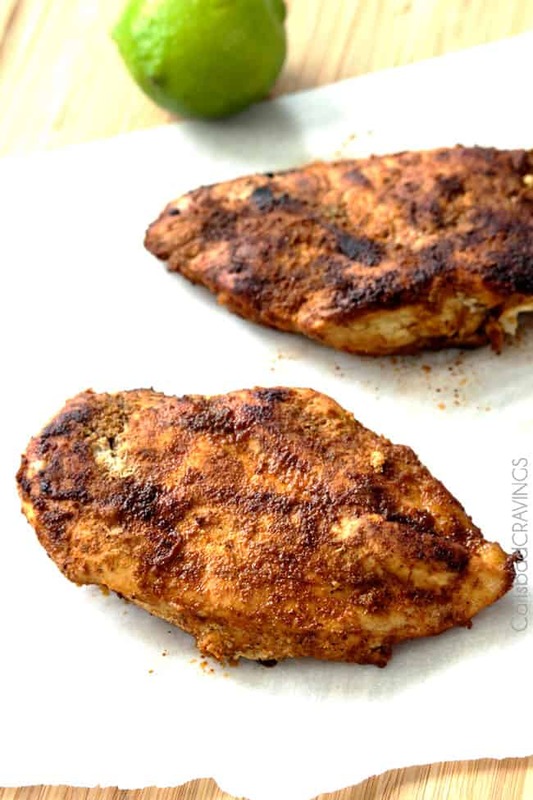 This chicken – and the rub! – looks amazing. And such a versatile thing to have on hand to top salads, toss in to pasta, etc. Yum! I had some chicken breasts defrosted and not a clue what to do with it…UNTIL this gem of a recipe showed up in my inbox. I actually put it together in the morning, so it pretty much marinated all day. I didn’t have Chipotle Chili powder, but I used some Ancho chili powder and raw honey in place of brown sugar, everything else was as is. It was delicious! I served it with Mexican rice, corn, guacamole and homemade salsa. My family loved it! Thank you for all of your recipes, they get me out of the dinner time rut. Hi Holly, so sorry for the delay in my response. I am SO happy to hear that your whole family loved this recipe – that is the ultimate compliment! Your whole dinner sounds delicious! and you are SO welcome for my recipes, I love hearing that they help get you out of the dinner rut. yay! I hope you continue to find more to love here! I have made this 4 times in two weeks! I don’t have all the spices but it’s still awesome! I cook it on the grill at about 350 for 10 minutes each side. I’ve also been marinading the chicken overnight. Served with some grilled peppers and zucchini, WINNER! That is awesome Hannah, I am so happy you love it that much – yay! I am actually making grilled chili lime chicken tacos this week based on this recipe – sound like you are a step ahead of me 🙂 Thanks for making my day! I follow you on Pintrest because of the phenomenal variety of pins. Your recipes look amazing online and I have noted quite a few to try. I have an app titled “Out of Milk.” It is a grocery list, pantry list organizer, and recipe file all in one. I can click on some recipes in Pintrest to add to Out of Milk, and it gives me an option to automatically add the ingredients of the recipe to m grocery list as I pin it. I guess some bloggers set up their accounts in Out of Milk for this convenience. Do you have any plans to use Out of Milk for your recipes? Thank you so much Susan! I don’t have plans to use Out of Milk at this time but I will check it out and let you know. Thanks! Oops meant to post that comment on the chili lime chicken tacos with grilled pineapple salsa, one of my favorite meals now! I am SO glad you took the time to comment Elizabeth and SO glad you loved the chili lime tacos and the rub so much – wahoo! I love grilling too so I will keep grilling recipes coming 🙂 Hope you find more recipes to love here and happy grilling! Quick question: Does the olive oil go into the bowl with the rest of the ingredients or is it used in the pan to cook the chicken? Sorry I didn’t see your comment until now – yes you add the olive oil the marinade. Hope that helps! enjoy! Thank you so much for this recipe! I have been using it religiously over the past few months and fallen so in love with it that I made a large batch to keep in my fridge for meal prepping. This chicken tastes great in everything I have put it in, and the marinade is great on pork as well. You are so welcome Sarah, Thank YOU for your wonderful comment! I am so happy to hear you love it enough to keep it stocked in your fridge – YAY! And it sounds delicious on pork – I am going to have to try that! Thanks again Sarah! I usually only eat dark meat chicken because I find the white meat dryer and not as flavorful. But I usually have some boneless, skinless breasts in the freezer for casserole dishes. So I decided to try this. I made it exactly per the recipe except chipotle chili powder … I substituted ancho chili powder (because that’s what I have on hand). I marinated mine overnight and then cooked as directed. It was DELILCIOUS! So moist inside and loads of flavor. Plus it was so easy and quick. I can see purchasing much more white meat chicken in my future! Awesome Peachy, I am so happy you found this flavorful, moist, quick and easy – what an awesome review- thank you so much!!! Just made this tonight…it’s fantastic! I can’t think of anything I’ve tried from your site that we haven’t loved. Thank you! Hi Lora, THANK YOU for making my day! I am so thrilled you loved this recipe and have loved my other recipes as well. I hope the trend continues 🙂 Thanks so much for taking the time to comment! Hi Beverly, thank you so much for taking time to comment, I really appreciate your kind words! I am so happy this chicken is a hit at your house – thank you and thank you for following my blog! I hope you have a wonderful weekend! I love this chili lime chicken rub. Is this a recipe that can be used in the crock pot? My time in the evenings can be limited and I was thinking that if this simmered on low in a crock pot, it would be ready to eat when I got home. I could prep the chicken and let it soak in the marinade all night, then put in the crock pot in the morning. Have you tried this recipe in a crock pot yet? Or have any thoughts on this? 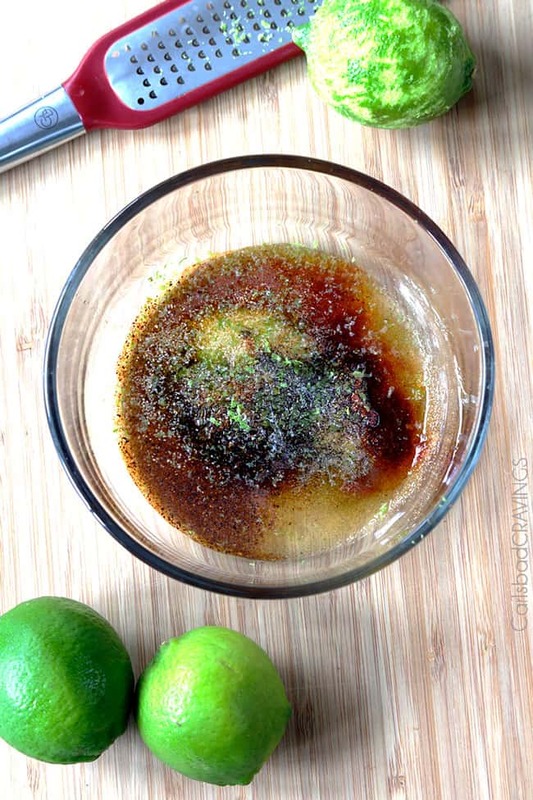 Hi Traci, I am so happy you love this chili lime chicken rub -thank you! I haven’t tried this in the crockpot but I bet it would be delicious! I would do it as you described and make sure you add about 2 tablespoons chicken broth just so the chicken doesn’t get dry. Let me know how it goes! will this work with chicken thighs? Yes, it will be delicious! I have made this chicken a few times now and I LOVE it! I eat it with big slices of avocado and a little sour cream on top. I’ve been exploring your website all night, and I have a few of your recipes I’ll be trying this week. Thanks so much for this great simple recipe! You are so welcome Tessa! 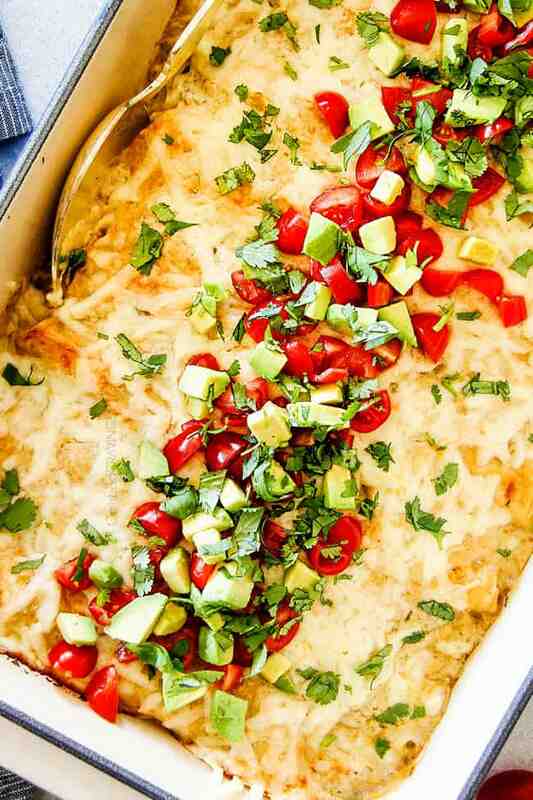 I’m so happy this has become a favorite of yours and it sounds like perfection the way you serve it with avocado and sour cream – yum! I hope you find many new favorites here! This looks amazing. I’m going to make this tomorrow. I’m going to now look at your other recipes. Thanks & keep up the great work. Thank you! I hope you love this chicken and have fun trying my other recipes! Wondering what kind/brand of pan you use to cook your chicken? This chicken looks so good! This is such a delicious recipe! There are usually leftovers when I make chicken for my family…”the sort of bland kind” my daughter pointed out to me tonight. 🙂 This one however, was gone in a flash and they were asking for more! So, so, so happy I’ve found your site. I’m using your recipes weekly! My problem is narrowing it down to which ones. They’re all so yummy looking!